Roy Connelly is an all-weather painter, working outside throughout the year. Painting exclusively in oils by direct observation of his subject, he can usually be found working on the banks of the River Thames, in central London or along the south coast. 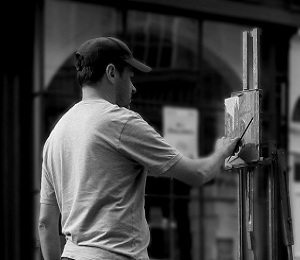 He has been painting professionally since 2004. In 2008 he was an Invited Artist at the ING Discerning Eye exhibition in London and in 2009 won the Chelsea Art Society Award for a Painting. In 2010 he was a finalist in The Bath Prize where his work was Highly Commended. His paintings have been exhibited regularly at the New English Art Club NEAC and the Royal Society of British Artists RBA. He has also shown at the Royal Academy Summer Exhibition. His work can be found in corporate and private collections in the UK, France, Belgium and Germany.